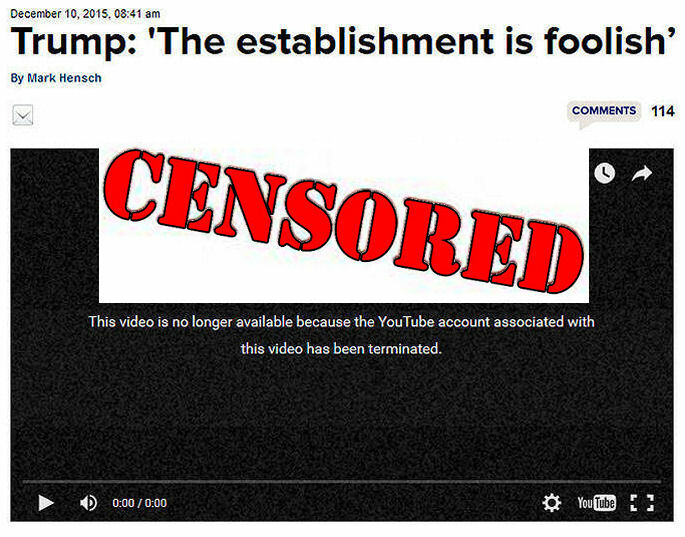 Was just viewing videos on DonaldJTrump.com and one titled ‘Trump: ‘The establishment is foolish’ is showing it is no longer available because the youtube account has been terminated. Further investigation shows this video is embedded from this article on thehill.com. It’s obvious “the establishment’ does not approve of what Donald J Trump has to say – and is doing everything in their power to censor him! GOP presidential front-runner Donald Trump said Thursday that the Republican elite are ignoring the will of the people at their own peril. This form of censorship is the accepted way of doing business on the net today. It goes deep into organizations and social media reputation management firms flagging YouTube videos, Facebook and Twitter posts, etc etc. I have never been a fan of censorship and after seeing this account terminated decided to blog about it. I like what Donald Trump has to say. Being an original Florida Cracker born in the early 50’s and being an old car dealer i have seen by beloved country go to hell! Donald Trump is right when he proudly says “Lets Make America Great Again” that’s damn right. Establishment politicians making deals with foreign countries selling our country and our jobs out. Lets look at Detroit Michigan as an example of what has happened to America in the last 40+ years. We had the finest highly skilled American Workers swinging wrenches building the finest cars anywhere. Look at Detroit Before And Now! It’s a crying shame that Ford is planning on building a new manufacturing facility in Mexico! Lets Help Donald Trump win the republic nomination and Vote for him in the upcoming elections. Not a registered voter? Get registered by clicking here on usa.gov.